With so many styles to choose from, you will find the perfect matching piece to compliment your PANDORA necklace or bracelets. With rings, necklaces, earrings, and bangles available in silver, silver with 14K gold, and pure 14K gold, PANDORA has created a universe of jewelry. Rings from PANDORA are available in silver and gold in sizes from 5 to 9 1/2. These necklaces complement other pieces of PANDORA jewelry or can be worn alone. 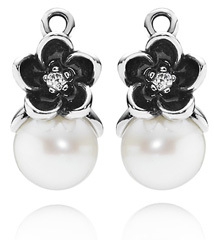 Complete earring sets that will compliement your other PANDORA jewelry. Earring posts and charms available separately that when combined create a unique pair. Pendants to be used with PANDORA chain necklaces. BraceletsBeautiful bracelets from PANDORA Jewelry that stand alone on their own, but still compliment the beauty of other pieces. EarringsEarring posts and charms available separately that when combined create a unique pair.